Canfield Notes, 1969. Courtesy of James Klosty. 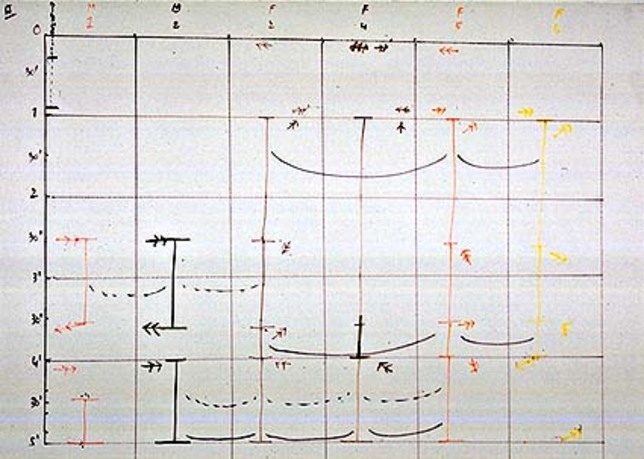 This project explores Merce Cunningham's use of drawings, text, and numbers to articulate the body's movement through space and time. 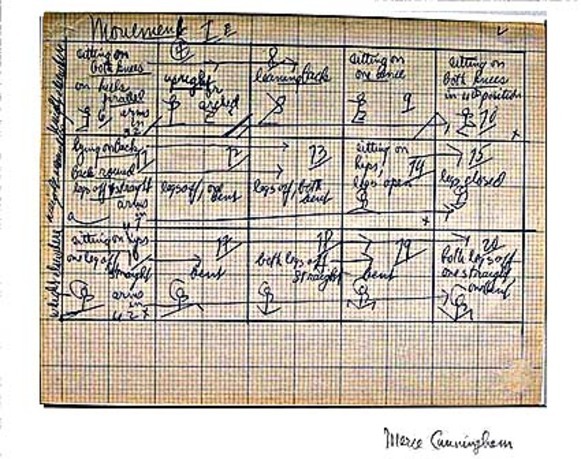 Cunningham's dance diagrams generate possibilities for movement, interceding before a work's elaboration rather than acting as notational records following its creation. Cunningham's diagrams are considered as spatial texts and read against contemporary understandings of the diagram in architecture. Through this juxtaposition, the project analyzes how the processes embodied in the diagrams—Cunningham's engagement with chance procedures; the morcellation of time, space, and the body; and the notion of collaborative autonomy—can inform ways of working in architecture. 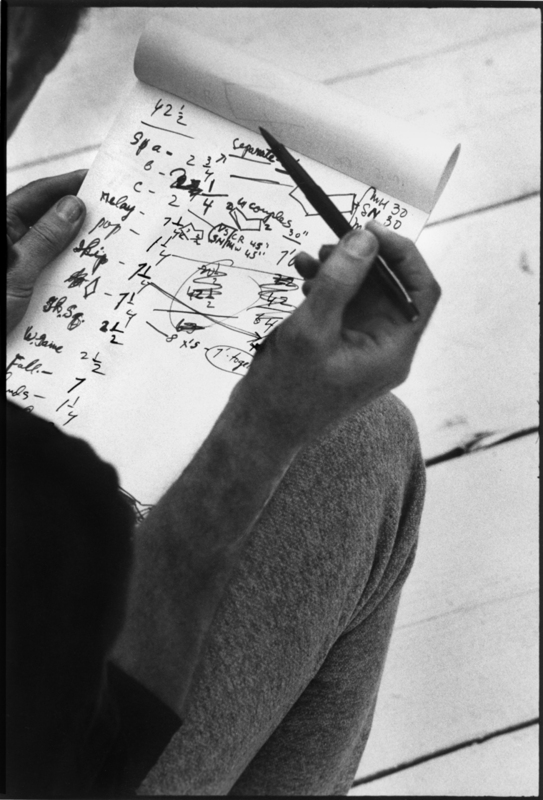 The project includes both research in the Merce Cunningham archives and interviews with collaborators from the company, including dancers, musicians, and artists. 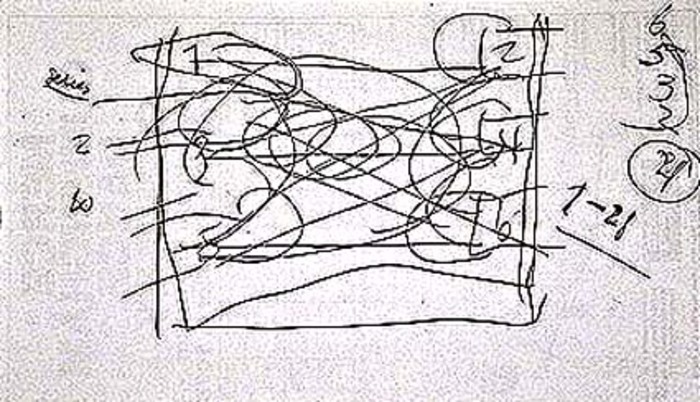 Through both a written and drawn analysis of this material, the project proposes a reading of Cunningham's choreographic notes that situates them within a larger diagram-based narrative and argues for their relevance to architecture itself. Sony Devabhaktuni is an architect, teacher, and writer. He studied English literature at Stanford University and architecture at the Cooper Union where he received the AIA Gold Prize Medal and a Fulbright Fellowship to France where he works and lives. He currently teaches at the École Polytechnique Fédérale de Lausanne, where he is a studio director and lecturer in the first year program and part of the design research team in the ALICE laboratory. With Raffael Baur and Patricia Guaita, he leads a summer workshop on 1:1 fabrication that brings together students from three Swiss schools of architecture; their first intervention will be a collaboration with the Valparaiso School of Architecture and Design (Chile) in August 2014. He is currently coeediting a book on the pedagogical approaches of the Valparaiso School which will be published by Routledge/EPFL Press in the winter of 2015.